Yin yoga is a slow-paced style of yoga with poses that are held for longer periods of time—five minutes or more per pose is typical. 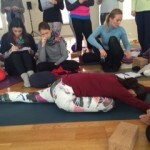 Yin yoga poses apply moderate stress to the connective tissues of the body—the tendons, fascia, and ligaments—with the aim of increasing circulation in the joints and improving flexibility. Yin Yoga has also strong bonds with the Chinese medicines. 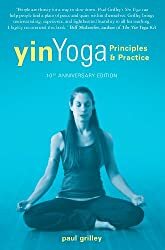 Having just completed a Yin Yoga teacher training course with Jo Phee, a senior trainer in Yin Yoga (ERYT 500), I discovered that Yin Yoga was more than just stretching. The main goals in Yin Yoga are to let the body come to an appropriate edge, to find the target area in the pose and relax the muscles and tissues in this area. The goals are also to cultivate a Yin attitude of stillness and breathing awareness for a mindful practice. Why is it linked to Chinese Medicine? As we practice Yin poses, we work on different meridians. There are 12 main meridians going through the body: the lung, large intestine, Stomach, Spleen, Heart, Small intestine, Urinary Bladder, Kidney, Pericardium, Triple Burner, Gallbladder, and Liver. Those meridians are all connected to one to another. They are also sometimes grouped into categories to explain emotions and impacts on the body. Lungs and large intestine are linked to the color white, autumn, taste spicy, body tissue: skin. The emotions are Grief and Sadness. Stomach and spleen: The season in the later summer, the color yellow, the element is the earth, the taste is the sugar, the emotion is the anxiety, stress, worries and the body tissue is the muscle. The heart and small intestine are linked to the summer, the color is red, the major element is the fire, the taste is bitter, the emotion is the excess of happiness/joy or excess of hate. The body tissues for those meridians are the blood vessels. The Urinary bladder and kidney are linked to the winter, the color is black, the element is the water, the taste is salty, the emotion is the fear and the body tissue are the bones. Gallbladder and Liver are linked to the season spring, the color is green, the element is the wood, the taste is sour, the emotion is the anger and the body tissues are the sinews. To work on Yin Yoga poses means to work on several meridians. Through the stretching and stressing of tissues, the flow of energy is enhanced. After a pose, the rest is very important as the tissues will recover from the stress. Fatigue and injuries will be avoided. 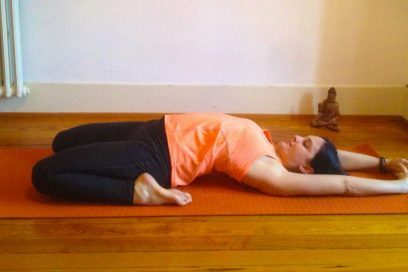 By practicing the Yin Side of the body, it implies cooling, lower, darker, and slower. It activates our feminine side. By practicing the Yang side of the body, it implies being in movement, hotter, faster, lighter, more active. It activates our masculine side. Yin and Yang are connected and we find them in all existence of life. Yin and Yang are actually connected in every situation in life. 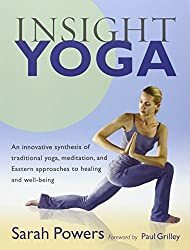 For more information about Yin Yoga, I recommend 3 books that can help new students in learning about it. As a consequence, we are not all made to do certain poses. Yin Yoga is very useful to come down and go through the poses in a meditative way. It is an excellent tools to stay grounded and nourish the body from inside.